North Carolina General Statute 20-138.7 sets forth two types of open container offenses. 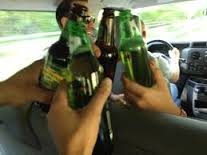 The first open container violation can only be committed by the driver of a motor while the driver is consuming alcohol or while alcohol remains in the driver’s body. This first open contain violation is a misdemeanor and is laid out in G.S. 20-138.7(a). The second open contain violation defined in North Carolina G.S. 20-138.7(a1) is only an infraction and may be committed by any occupant, driver or passenger, of a motor vehicle. Before we go into detail about the distinctions between the two different open container charges in North Carolina it is important to understand how terms like “motor vehicle,” “alcoholic beverage,” “passenger area” and “open container” are defined in North Carolina. “Motor vehicle” means any vehicle driven or drawn by mechanical power manufactured primarily for use on public highways, including mopeds. Prior to July 1, 2015, the term “motor vehicle” encompassed only vehicles that were required to be registered under North Carolina law, and prior to July 1, 2015, mopeds were not required to be registered. “Alcoholic beverage” is any beverage containing at least one-half of one percent (0.5%) alcohol by volume, including malt beverage, unfortified wine, fortified wine, spirituous liquor and mixed beverages. “Passenger area” means the area designed to seat the driver and passengers and any area within reach of a seated driver or passenger, including the glove compartment. The trunk of a vehicle or the area behind the last upright back seat of a station wagon, hatchback, or similar vehicle is not considered part of the passenger area. A container is deemed to be an “open container” if the seal on a container of an alcoholic beverage has been broken. This rule applies even if the lid to the original container has been reapplied. Additionally, a glass, cup or any other container containing an alcoholic beverage is deemed an “open container” as defined by G.S. 20-138.7(f). A conviction under G.S. 20-138.7(a) inflicts both criminal and DMV punishments. Criminally, a first offense under G.S. 20-138.7(a) is a Class 3 Misdemeanor. A second or subsequent offense is a Class 2 Misdemeanor. For purposes of the North Carolina Division of Motor Vehicles (NCDMV), a violation of G.S. 20-138.7(a) is considered a moving violation and points will be assessed against your driver’s license. In addition to being assessed points on your driver’s license a conviction under G.S. 20-138.7(a) can result in license revocation. A first conviction does not trigger a license revocation but a second conviction results in the six-month revocation and a third or subsequent conviction results in a one-year revocation of one’s driver’s license. Police officers frequently use an alcohol screening device to demonstrate that the driver has alcohol in his/her body when seeking a conviction under 20-139.7(a). The alcohol screening device, also known as a PBT or roadside breath test, must be performed on an approved device and must be used in accordance with the applicable regulations set forth in 10 N.C.A.C. 41B, §§ .0501 - .0503. Only certain evidence gained from the PBT can be used in court. The specific alcohol concentration cannot be used in court, however, whether or not there is a presence of alcohol can be used. while the motor vehicle is on a highway or the right-of-way of a highway. Only the person who possesses or consumes an alcoholic beverage may be charged with a violation of G.S. 20-1387.7(a1). A violation of G.S. 20-138.7(a1) is an infraction, punishable by a maximum fine of $100.00, and is not a moving violation, and accordingly, no driver’s license points will be assessed against one’s driver’s license. However, the same license revocation provisions that apply to the misdemeanor open container, G.S. 20-138.7(a), apply to the infraction open container under G.S. 20-138.7(a1). Thus, there is no revocation for a first conviction, but upon a second conviction there is a six-month revocation and for a third or subsequent conviction a one-year revocation. If you a charged with an open container violation in North Carolina contact the experienced lawyers at Browning & Long, PLLC. Todd and Howard prosecuted thousands of open container violations while they were Assistant District Attorneys in Charlotte, North Carolina and will use their unique experience to thoroughly review your case and seek the most advantageous outcome possible.